You are here: Home / How to buy Premium E Liquid? How to buy Premium E Liquid? The best decision the user of an e-cig can make is to buy premium e-liquid. Using the cheap unknown e-liquids is never advised for e-cigarettes. One of the greatest things that can happen to the smoker is finding the flavor that is most favorable. There is also the decision of getting the nicotine strength that is best suited to the individual user. There are quite a number of options to choose from but the buying the best e-liquid is made a lot easier when the competition is narrowed to the premium vendors. The nicotine liquid which is also referred to as e-liquid or e-juice may be purchased based in any taste, budget, personality or mood. A user may also enjoy the aroma and flavor of a combination of any of the offered flavors. The nicotine level may also be adjusted based on the immediate need of the user as well. The smokers that enjoy a higher nicotine level may have the satisfaction of this while the opposite end of the spectrum, no nicotine, may enjoy this as well. The nicotine levels of each e-liquid are made to suit the needs and the taste of each user individually. This is a feature that has been attracting more and more users to the electronic cigarette as they have the option of regulating nicotine usage. This is most beneficial to smokers who desire to completely stop their nicotine intake. There are also users who prefer to use the nicotine free liquid just for the satisfaction of smoking. The goal of the smoker who is attempting to wean from nicotine altogether is to get from 54mg to 0mg. This will stop their craving for the substance. The user can start out with a medium strength e-liquid to see if it suits their preference in nicotine concentration and work their way down. 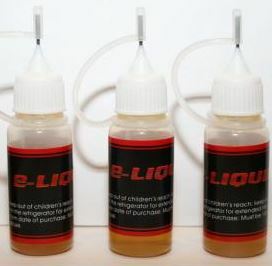 The strength of the e-liquid is usually found on the bottle in measurement of mg/ml. The dosages may vary according to the manufacturer but they however provide a general guideline which must be followed. The flavors of e-liquid are assorted and may range from cigar and tobacco flavor to something that is more flavored and sweet. Some of these e-liquids have been made to give the essence of an actual cigarette and have flavors such as menthol and tobacco. There are also flavors such as coffee, vanilla, sweets, fruits or chocolate. More premium manufacturers will offer exquisite flavors such as strawberry daiquiri. It is always advised that the user try a variety of liquids before deciding on the one that is most suited to their tastes and nicotine level preferences. When purchasing e-liquid from a new vendor, it is advised that the user try at least three flavors to begin with. Once the flavors that are most preferred are identified, then the perfect one may be selected more easily. The e-liquid that best suits the user will make the experience much more enjoyable and they should not be afraid to experiment with the different flavors.